Featuring a full-size keyset and an integrated multi-touch trackpad, this All-in-One Media Keyboard will let you type, swipe, drag, zoom, and click with ease. 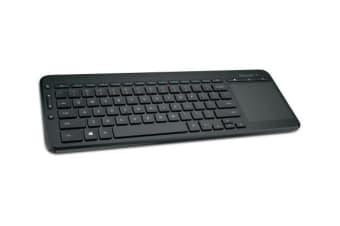 The Microsoft Wireless All-in-One Media Keyboard (N9Z-00028) is the perfect device for your living room or home office. It has customisable media hotkeys that put the web and your favourite music, photos, and films at your fingertips. The keyboard also has a durable design, so there is no need to sweat the bumps, drops, or spills of everyday life. The All-in-One Media Keyboard is all you need for comfortable typing and effortless navigation. Compatible with the following operating systems: Windows – Win 8.1 32 bit, Win 8.1 64 bit, Win 8 32 bit, Win 8 64 bit, Win 7 32 bit, Win 7 64 bit, Win RT 8.1, Win RT 8. Mac: Mac OS 10.10, Mac OS 10.9, Mac OS 10.8, Mac OS 10.7. Android: Android 5.0 Nexus 9, Android 5.0 Nexus 5, Android 4.2, Android 3.2.